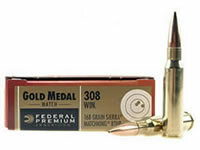 Federal Gold Medal Match 308 Winchester Match Ammunition – I was first exposed to Federal GMM in my youth trying to squeeze every bit of accuracy out of my custom Colt Gold Cup and Smith & Wesson 745 pistols. Later as I moved further in to rifles Federal GMM became my “Go to” round of choice in 22-250 and .308 Winchester, Admittedly for 22-250 I eventually gravitated to Hornady for its lighter more explosive projectiles. Not for accuracy. Today in 2016 for my DPMS LR-308, Armalite AR-10 the Federal fodder is still my first choice when putting rounds on paper. Federal Gold Medal Match Ammunition is the quality and consistency of the finest handloads. When you want the most accurate 308 round for Military, Law Enforcement and Competition the two Federal offerings are a safe bet you can count on from shot to shot. These heralded loads combine the legendary Sierra® MatchKing® Boat-tail bullet with Federal’s proprietary delivery system. Stringent manufacturing controls give you what many experts and international shooters consider the most accurate match round available from a factory. World-class competitors, as well as military and law enforcement officials, choose Gold Medal when it counts the most.